A humble Papua New Guinean from Western Highlands is stranded in Manila, Philippines because he cannot afford to pay for the increased medical bills incurred during a major operation of mouth cancer. 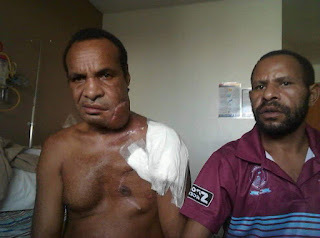 Win Kopul from Tambul district, married with four (4) children who resides in Port Moresby with his young family was diagnosed with a known mouth cancer. Before he encountered this sickness, he was a bus driver in Port Moresby. In May this year, doctors recommended and advised him for an operation overseas before the cancer could spread to other parts of the body and eventually caused his life. His tribesmen, relatives and friends quickly acted to pledge and contribute in totally of K90,000.00 to save his life which he organized to fly to Malina for an emergency operation. It was a success story that he spend the K90,000.00 together with a helper, William Topps, who accompanied him to Malina and the operation was successful. Win is now talking to his young family over the phone from Malina that he is slowly recovering and wounds from the operation are healing. That's good news and the four lovely kids are waiting to see their daddy coming home soon. However, the medical bills skyrocketed beyond K90,000.00 as the operation took almost three months interval, cutting parts of his body from his shoulder and his chest to replace the cells of the body that being destroyed by the cancer cells. The balance of his medical bills now stands as K120,000.00 in PNG Kina and he cannot afford to clear off this money and currently waiting in vain in Manila. He send messages back home but the amount is way too high for his relatives, family and tribesmen to contribute. His wife Theresa in Port Moresby said their last savings had finished when continuously sending money for his expenses in Manila and don't know what to do next now. She said she wanted to do some fundraising and thus giving out her mobile number and her husband's bank account details for people who wanted to help to take back her husband and the father of the four beautiful kids to return home. Contact Theresa (wife) on mobile: 71514984.